California police officers speak less respectfully to members of the public who are black than to those who are white, researchers studying body camera footage say. 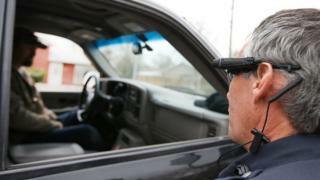 Scientists developed a way to measure levels of respect, based on the officers' language during routine traffic stops in Oakland City. 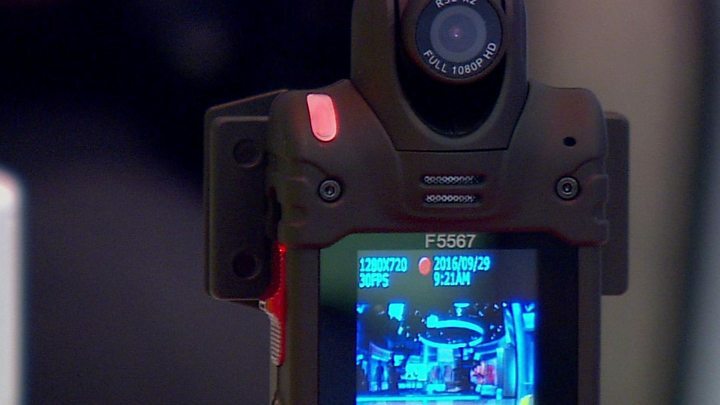 It aims to use bodycam footage to help improve police-community relations. While bodycam footage has been used as evidence in criminal cases - including some where complaints have been made against police - the aim of this study was to turn this continuously gathered footage into data and use that to track and improve everyday policing. "These routine interactions are important," said lead scientist Prof Jennifer Eberhardt, "they're the way most people encounter the police." "And people care as much about how they're treated as whether or not they got a [speeding] ticket. "It can affect how people view the police, how they think about the police - whether or not they want to co-operate with them." The study was part of a unique, decade long research collaboration between Stanford University and the Oakland Police Department in California, which began when the department asked Prof Eberhardt to analyse their stop and search data. "We had location and details [of who was stopped], but we also had the camera's recording of every interaction," she said. "I figured we could could analyse exactly what's happening here." The Stanford team transcribed 1,000 interactions between police and members of the public, then picked out a random selection of 400 "utterances" made by officers during these dialogues. They then had a group of volunteers read and rate these utterances, with each one being rated by at least 10 people. "[Our volunteers] looked at the text without knowing the race of the officer or of the community member," said Prof Eberhardt. "The task was to come up with a score that quantified respectfulness, so each utterance was rated for politeness, friendliness and how formal or informal it was. "Then we looked for what we call the linguistic correlates of that rating- so what words are present when something is scored as more or less respectful." Co-author of the study PhD student Rob Voigt explained how the team had used these volunteers' ratings to develop a computer model that could automatically analyse the utterances - searching and scoring subtle linguistic markers that made an officer's language more or less respectful. "Our computer model learns to measure each of these linguistic features," Mr Voigt said. "So we can ask, 'How polite is it when you apologise?' and it can give us a number. "So, apologies, calling someone 'sir', taking an interest in the person, maybe by saying, 'Drive safely,' they're all perceived as more respectful. "And then disrespectful features include questions, negatively charged words and using terms like 'bro' or 'man', or first names rather than titles," he said. Prof Eberhardt said they had found "real racial disparity in officers' language use". The researchers' main collaborator in the police department, Deputy Chief Leronne Armstrong, told BBC News that Oakland PD wanted to examine interactions with the community in order to "better train our officers and improve the way we communicate". "We've heard many times the community's concern about racial profiling," he told BBC News. "We have to be willing to ask those really tough questions about what our officers are doing." Prof Eberhardt also stressed that these findings did not "equate to racial bias". "There could be many reasons why you have the differences we're finding," she said. "It could have to do with a particular law enforcement strategy, police policies, the community members' language, or if there's tension already in a community because of a recent high profile case. "We're trying to understand the root, but we're not taking for granted that it's bias." Deputy Chief Armstrong added: "This [collaboration] really is ground-breaking." "No other police force in the the country has opened up [and given scientists] access to this data. "[And] this report will be a way in which we can learn and be better - to be the best we can be for our community. "Any police department should do the same."